Prices of goods and services change every day in Tycoon Online, except from the first four days of a round; the initial prices are now random each round. (Remember the game starts on Day 0. So when it's Day 3 of 70, it's actually the fourth game day. Just know that when the game changes to Day 4 of 70, prices will start to change.) This brings challenge to the world of Tycoon Online as it is hard to know what products will do well, and what products will do poorly, what services are expensive and what services are cheap. The calculations of the new prices happen every midnight and depend on how the market has developed during the day. Understanding and being able to predict these changes helps greatly when competing for game ranking. This is the price you obtain for the goods you sell on the market. The price of each type of goods varies. The change of prices is influenced by what level the product is, as well as how much of it has been produced during the previous day. 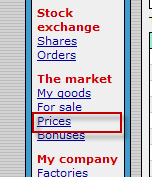 To learn how the calculations of market prices are made every night, see 6.1 Calculation of market prices. Shop prices (customer prices) will at all times equal 150% of the market price of a product. For instance, if one newspaper is worth 50 iKr on the market, a shop will sell it for 75 iKr. Also, if there is a lot of the material a product is produced from available on the market, you are awarded customer price bonuses. For every 50 000 units of one type of material piled on the market, all products produced from this material gain a 1 iKr bonus to their shop prices. For instance, if there are 50 000 units of wheat on the market, the shop price of alcohol and bread will increase by 1 iKr. This is the price of the services offered by offices. For ever hour of consulting, an office will make this amount of money. The price of each service varies depending on city populations and the number of the different types of offices based in each city. Thus the price of services will be different from city to city. To learn how the calculations of office prices are made every night, see 6.2 Calculation of service prices. you can see these prices in a number of places for instance on the build a new office screen or the main office screen for an office you already own you should see.. This page was last modified on 17 June 2015, at 16:15. This page has been accessed 22,969 times.